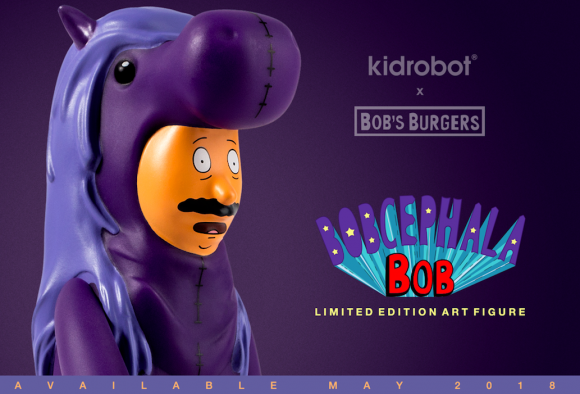 Here is another great release post by our goof friend Chris Holt aka The Toy Viking about the new Bob’s Burgers Mini Series 2 and the Bob’s Burgers Bobcephala Medium Art Figure that were added to the rest of the Kidrobot x Bob’s Burgers capsule online at www.kidrobot.com! This new figure from Bob’s Burgers and Kidrobot is testament to how far parents sometimes have to go for their children. It is also testament to just how weird fandoms can get. Bob’s daughter Tina goes to a convention centered around a pony-based television show where she learns that the majority of its fans are grown men who really want her rare pony figure. Bob then has to don a costume in an effort to get her toy back after she gets scammed out if it. In a related story, I was once in a hotel in Seattle that was also hosting a furry gathering. It was my first time ever visiting there and apparently a group of people dressed as colorful fox like creatures do not always greet you at check in. I thought it was a west coast thing, but it turns out I just have bad timing. I’m no expert, but if you’re willing to dress like a horse to help out your kid I think that makes you a good parent. If some dude tricked my kid out of their expensive toy I’d probably just put him in a headlock, but I guess a more undercover approach could work too. My way probably wouldn’t make that great of a toy either. This pillar of fatherhood is available now at www.kidrobot.com.